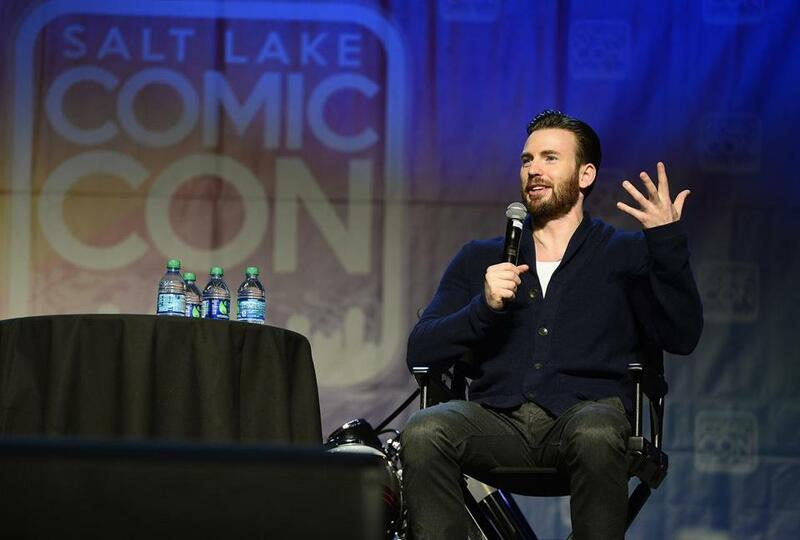 Actor Chris Evans spoke during a panel at Comic Con in Salt Lake City last month. Students from David Gerzof Richard’s class at Emerson College have learned how to manage their personal brands online from some big-name athletes like Chad Ochocinco, and New England Patriots players Julian Edelman and Rob Gronkowski. Now they want to hear from an actor: Captain America himself, Chris Evans. Students from Gerzof Richard’s “MK 358 Social Media Class” launched a Twitter hashtag campaign this week, called #EvanstoEmerson, to get Evans to Boston to speak with them in person, as part of an assignment. Gerzof Richard conducts the guerrilla campaigns each year with his students. The assignment is to pick a local celebrity, get his or her attention, and connect online — then reel the celebrity in. As a stipulation of the assignment, the guests have to be someone with local ties whom they can physically meet. Evans has roots in Massachusetts. The actor, known for his roles in “Captain America: the First Avenger,” and “Snowpiercer,” grew up in Sudbury. The students also have to pick what’s known as an “ask,” or specific request they’d like the special guest to fulfill. In the case of Evans, students want the actor to address anxiety and mental health issues. Evans has openly discussed his struggles with anxiety during past interviews. “As an advocate for mental health and having spoken about your own struggles, we’d love for you to come to Emerson and speak with our community about why mental health wellness is vital,” the students wrote in their plea to Evans. So far, Evans has not responded to the students’ constant tweets. The idea that students could convince a well-known actor to take time out of his filming schedule to speak with them may seem far-fetched. But Gerzof Richard’s past classes have pulled it off with relative ease. Last year, Edelman, a wide receiver for the Patriots, brought burgers to Gerzof Richard’s class. In 2012, it was Gronkowski, the Patriots tight end, who arrived at Emerson to impart his wisdom. And in 2011, the celebrity speaker was Ochocinco, who at the time was a receiver with the New England Patriots. Ochocinco took his visit with the students a step beyond simply offering his advice on how to leverage social media to build a brand. He treated the entire class to dinner at All Star Sandwich Bar in Cambridge. “He said, ‘Order what you want,’ and threw down his black [credit] card,” said Gerzof Richard. This year’s class decided to bypass the athletes from the area, and instead grab the attention of an actor. Besides having Evans speak openly about his anxiety, students would like to hear about Evans’s work with charity organizations. “They know he’s altruistic and does some really good stuff,” said Gerzof Richard. The class meets once a week, so in order to make some noise, they need to connect daily online. That’s why Gerzof Richard had them set up a private Facebook page to continue discussing their strategy outside the classroom. Nicky Fox, a junior in Gerzof Richard’s class, said it’s been difficult for students to coordinate their social media campaign, but the project is coming along nicely. “It’s been fun to see everyone come together on this,” she said.